Google analytics doesn't count the visitors on my homepage only since the 23rd of may but it's still visited by loads of people for sure. I figure what I could have done to cause this issue. Do you think such issue might have been caused by the update ? I just remembered I had this issue before. It's comes from JCH Analytics don't work well with the combining and minifing tool of JCH. The update of JCH on the 23rd of may is probably in cause and regular lab has certainly nothing to do with all that. Thanks for your help Peter. I am also using JCH - there is an other update to 5.1.2, released 14 June 2017 19:00. While using the free version, I experienced it's better not to use the maximum of 'combining and minifing'. Also in combination with Regular Labs tools from Peter, I am running several stable projects with propper code and no errors. You are right if I don't use the maximum level of settings in jch or don't use JCH at all I would not get anymore issues. Having just had the same issue with a few sites after deploying JCH Optimize, and using ReReplacer to deploy my Google Analytics on my site, I've just found the solution that might be helpful to you all, and it's likely others. 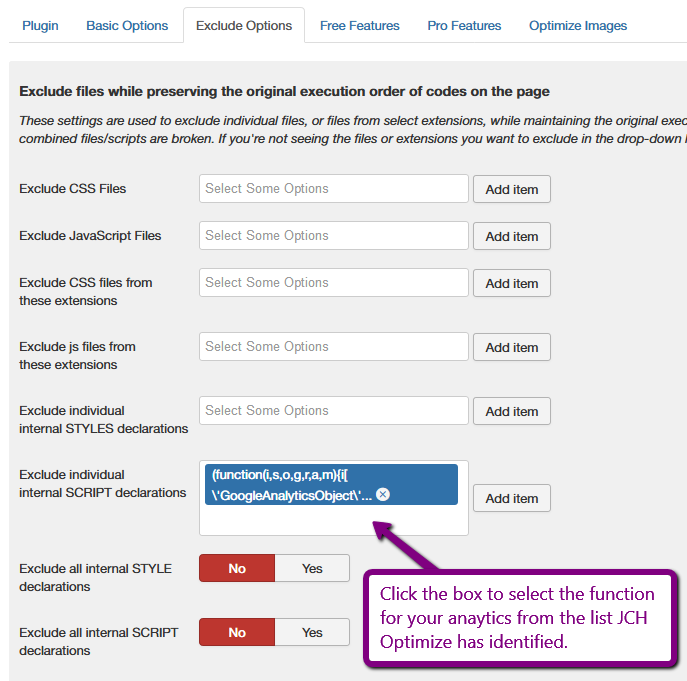 On the Exclude Options tab in JCH Optimize Pro, click the box to select the function for your anaytics from the list JCH Optimize has identified (you may need to go see what that looks like before you turn JCH Optimize on). Add the item, and save the plugin to save the change.